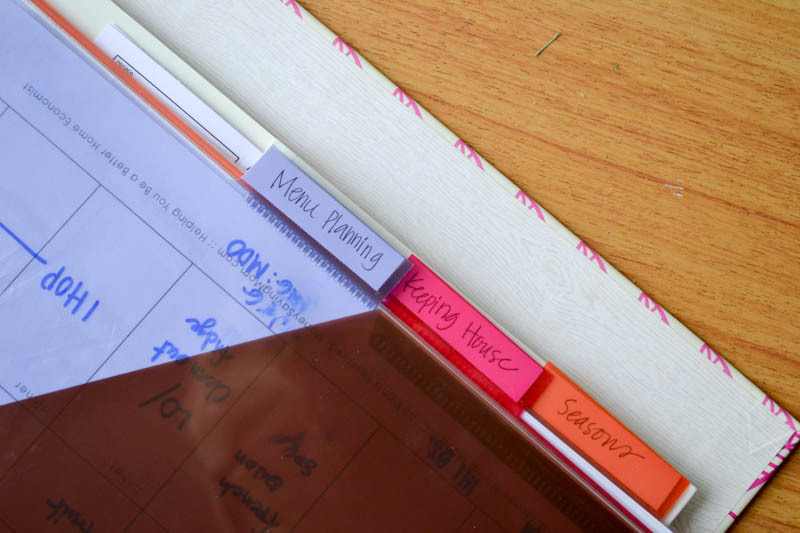 A homemaking binder is one of the most important ways that I keep my home sane and running smoothly. As I wrote yesterday, I keep mine not only for the practical, but for the dreaming and visionary too. Today I want to show you my practical. Ah, food. I have such a love/hate relationship with food. More specifically, I love eating & often hate the time/work that goes into creating good meals for my family. When I was single I always ate well – I just ate whenever I wanted. But now that I have kids to feed, and they have the audacity to actually want dinner at the same time everyday – I have to have a plan. This means making a weekly meal schedule. And that’s not just dinner. I plan breakfast, lunch and snacks too. It is more work in the moment, but so much less stress during the rest of the week. 1. I look over the calendar for the coming week & write down all pertinent plans at the bottom of each day (when is my husband on call, do we have any meals out planned, is anyone coming over, do I have an especially busy day). 2. I look in the fridge to see if there are any ingredients I need/want to use. Lots of spinach about to go bad? Leftovers from the week before that need to be used? Those become lunch or dinner plans. 3. I plan dinners first. Since breakfasts & lunches are really on a rotation I usually start with dinners. I think through each day & pick out something to cook. I try to write down our complete meal, not just the main course, so I can make sure I shop correctly. And again, it’s less stress to have it all written out then to get to that night & only know I am making chili. With what? Rolls, cornbread, a salad? I have another sheet I reference during this time. At the recommendation of this blog post, I created a list of my most well-loved meals. I have been adding to it over the last few months & now have a pretty good list to refer to that help me keep things creative & on a good rotation. I will admit that I often try 1 new dinner a week. It keeps me on my “food toes” and if we like it then it goes on the master menu list. Also, I usually have at least one night a week that is easy – think sandwiches or egg-in-a-holes or leftovers. Sometimes I have two or three nights like this – depending on the week. It’s super important to note that if I have a leftovers night then I intentionally make more food so I will actually have leftovers. 4. Once I have completed my dinners I go back & fill in my breakfasts, lunches & snacks. I rotate through the following for breakfast: cream of wheat, oatmeal, cereal, toast/yogurt and muffins/yogurt. It’s easy, simple & my daughter and I both really enjoy all of the above items. If my eldest enjoyed eggs I would rotate those in as well, but eggs are pretty much the only food she has never liked since first eating them. I rotate through the following for lunches: PB&J, ham sandwiches, tuna salad and leftovers. Again, all things I and my daughter like. Also things that are easy, easy, easy. Snacks are a combination of: fruit, graham crackers, goldfish crackers, pretzels, applesauce, yogurt and the little squishy packets of mushed up fruit. In the summer we also do smoothies. 5. I make my shopping list accordingly. I usually keep my list on the fridge throughout the week & write things down as I notice they are running low. Then when I menu plan I fill in with the ingredients I will need to make the week work. 6. I shop, cook & eat! 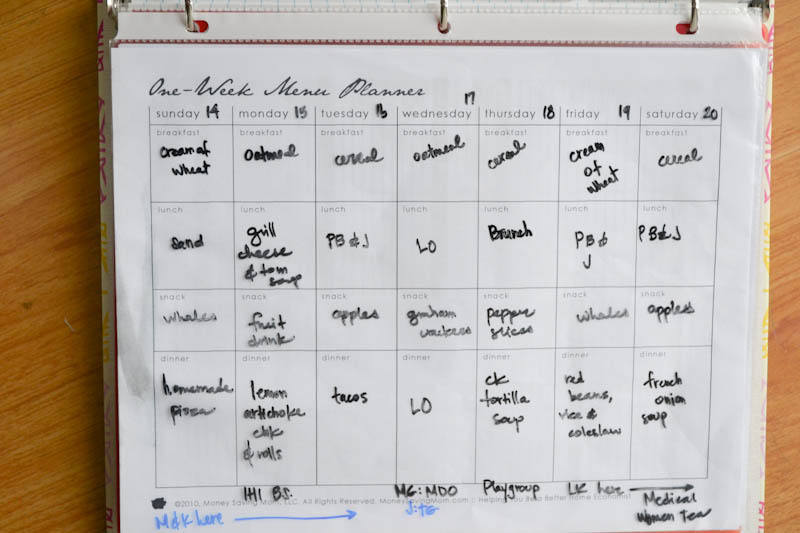 I use the weekly meal planner from Money Saving Mom. I actually have two printed & in clear sheet protectors that I write on with a wet erase marker. Each new week I clean it off & write on it again so I am not constantly printing off new copies. Also, having two keeps me from having to wipe off the meal plan for the week I currently am in as I usually plan through Sunday & shop on Saturday. I really urge you to go read the whole series that OurMothersDaughters has on food prep. You need to watch the far right column on the page as you scroll down until you get to “Happy Home: Food Organization”. Really, really good stuff. Actually, all of it is really good stuff and I might as well wish you good-bye because once you start reading their blog posts you can get lost for months trying to read all the backposts they have! These ladies are some of my all-time favorite female bloggers so enjoy! This tab is filled with my schedules for cleaning my home. I am, by nature, neat rather than clean so it takes work & planning to ensure my house actually sees some form of cleaning solution during the month. On my daily flow sheet I have a few different times in the day I set aside for chores. I am talking about 10-15 minutes a few times a day. And by the way, I count making my bed, prepping dinner, cleaning the kitchen and tazing my house as chores. Then I have a weekly chore chart where I list the “real cleaning” I need to do daily. Monday, for instance, I try to clean our bathroom. Tuesdays I mop the kitchen & dining room. You get the idea 🙂 This helps me tremendously to keep my house tidy & clean without feeling overwhelming. And you know what? I often don’t get to these “major” chores as often as I would like. The days get busy. I blog instead (hello!). But at least I have a plan, right? The other thing I keep in this tab is a list of all the items I would like to purchase/make/find for my home. I have each room listed as a “heading” and under it I am constantly writing things I would like to invest in for that space. This keeps me focused when I go shopping for my home, and also helps me keep an eye out for deals! I use the Daily Cleaning List from Money Saving Mom. I also use her Monthly/Semi-Annual Cleaning List. They are both under “Cleaning Lists”. 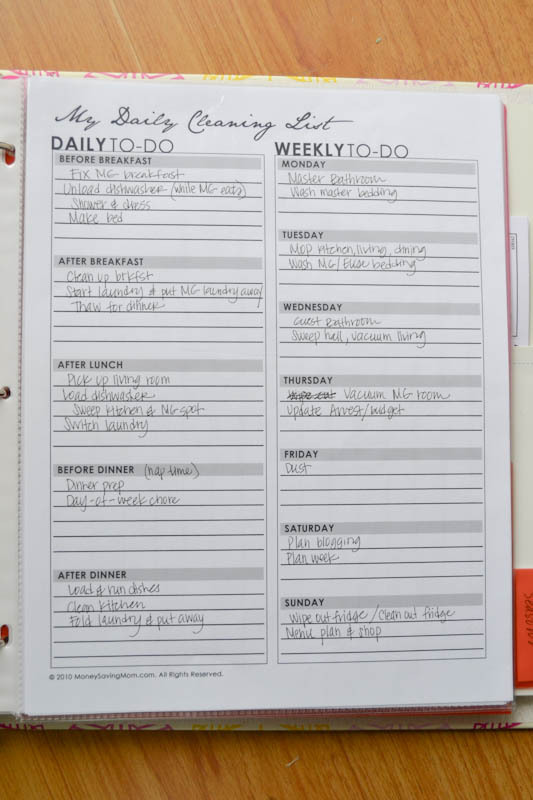 I also referred to the Master Weekly Checklist from Simple Mom to make my own household to-do items. This tab just keeps things I only need to refer to seasonally. 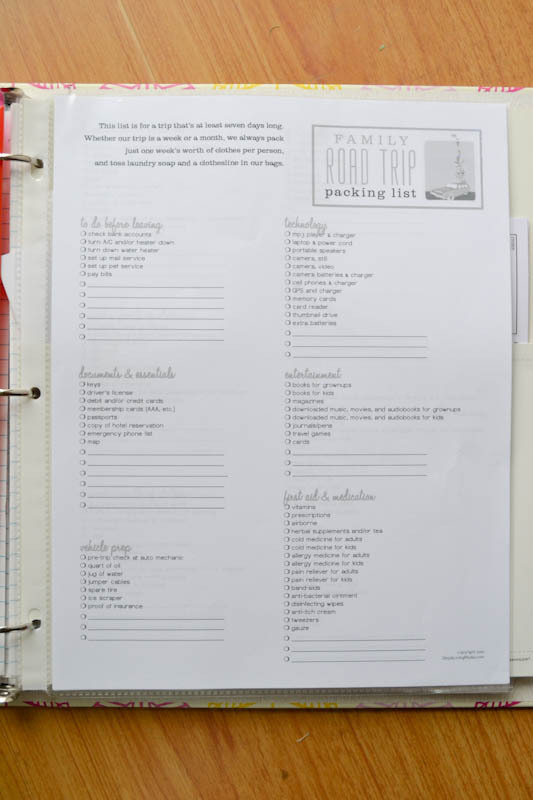 Right now the only thing in it is our “Family Road Trip Packing List“. It’s a helpful list for when we travel so that I don’t forget anything we need. I never needed this when it was just my husband and I – but good heavens, having kids changes that, doesn’t it? I printed the list from Money Saving Mom & have customized it to fit us. I hope this was a helpful journey through my homemaking binder. I also hope you are inspired to find your own ways to keep your home organized and flowing smoothly. Tomorrow is the last day in October! I am just a little excited. AH! Love this. Your blog has blessed me so much the past couple months. I made a momma folder/homemaking binder last night and finished it today. I’m hoping it will help keep my house (and our master) in order 🙂 I’ve meal planned for awhile now, but I’m excited to have everything in one folder. I have a question…….Do you include your husband in on the chore list or daily cleaning? I know it is different for different people/marriages. I’m also a stay at home mom, I’m a full time student, and my husband works full time. Since our son was born, I just took over the household chores because I stay at home and he helps out with certain cleaning things. I’m starting to feel like I do it all with little help from the hubs; yet, I’m SUPER thankful that he provides for our family and curious how other families work in this way. P.S: my husband would HATE it if I wrote out a chore list for him!! ha We tried that many years ago. Hey Allie! So glad this was helpful! 🙂 To be honest I don’t ask my husband to do anything around the house. He has always taken out the trash & overseen the yard work, but I am happy to do the first if need be & I have even done the second on occasion. I do all the housework, take care of the cars, grocery shop, cook, etc. My husband is a resident who works 60-80 hours (or more) a week, so I really try and make home time a place he can focus on family & rest. That being said, he is an amazing man who will try to help me fold laundry occasionally (my MOST HATED household task), clears the table & sometimes cleans the kitchen. He does little things to make my life easier, like putting his laundry in the right hamper (I pre-divide laundry to make it easier to wash) and has been known to occasionally wash a load. That’s our marriage & life right now. I do think that if you need help around the house it would be great to have that chat with your husband. Make sure you cover that conversation in prayer so he feels loved & respected – not attacked & belittled. 🙂 Hope that helps a little! I feel the same way- my husband works so much and I feel that I should make the house peaceful. It took me A LOT to get to that mindset though and I still have to work through those struggles from time to time 🙂 I think as a stay at home mom that has been an issue for me. But I have for sure been praying about it ,and honestly, I think it’s as easy as saying, “Sweetie, I need help this week could you possibly help me (fill in the blank).” Today when I came home from an alllll day Early Childhood Development school thing he was cleaning the living room. I was THANKFUL! Blessing to you- have a good weekend! !